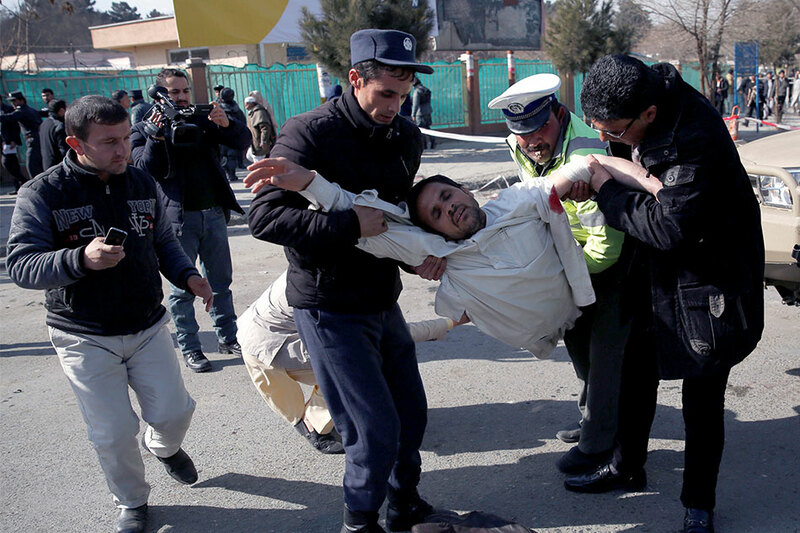 KABUL, Afghanistan—A bomb hidden in an ambulance killed at least 95 people and wounded about 158 in the Afghan capital, Kabul, on Saturday when it blew up at a police checkpoint. The Taliban claimed responsibility for Saturday's suicide blast. They also claimed the attack on the Intercontinental Hotel a week earlier in which more than 20 people were killed. "It's a massacre," said Dejan Panic, coordinator in Afghanistan for the Italian aid group Emergency, which runs a nearby trauma hospital that treated dozens of wounded. The U.S.-led international force in Afghanistan vowed its support for the Afghan government and armed forces in their "difficult and dangerous work", adding that none of its members had been killed or wounded in the blast. The casualty toll is the worst since 150 people were killed in a truck bomb explosion last May near the German embassy, not far from Saturday's blast, an attack that prompted a major reinforcement of security in the city. People helped walking-wounded away as ambulances with sirens wailing inched their way through the traffic-clogged streets of the city center. "I was sitting in the office when the explosion went off," said Alam, an office worker whose head was badly cut in the blast. "All the windows shattered, the building collapsed and everything came down."